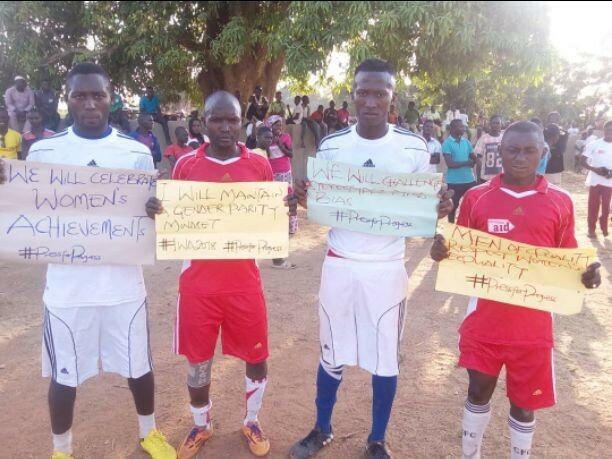 In its bid to end gender-based violence especially at the rural communities, a Kaduna-based non-governmental organisation, Gender Awareness Trust (GAT) has organised novelty football matches in four communities in Zangon Kataf local government area of Kaduna State. The football matches were played on Wednesday simonteneously with Fadan Kamantan slogging it out with Kamuru Ikulu at the LEA Primary School Fadan Kamantan, while Ramai Zonkwa hooked Zonzon community at LEA Primary school premises at Zonzon. The matches ended with Fadan Kamantan defeating Kamuru Ikulu 2-0 while Ramai Zonkwa won 1-0 against host Zonzon community respectively. In an interview with newsmen at one of the venues of the matches in Zonzon, Project Monitoring and Evaluation Officer of the NGO, Mrs. Tyda Abba said, the event was part of the Organisation’s Collective Action for Adolescent Girls Initiative (CAAGI) project and to commemorate this year’s World Women’s Day on March 8. Mrs Abba said the event was also to raise consciousness on the ills of the various shades of violence mated against women and adolescent girls in the society. “There is no excuse for any form of violence as any aggrieved person is suppose to seek redress from a court of law rather than take the law into his hands,” she said. The Spokesperson said the organization engaged men in the campaign described them as “male champions,” who also played key role in the advocacy to ending gende-based violence. She enjoined all to join in the campaign to rid the society of violence to increase the pace of development and enhance mutual trust and understanding among all sexes. Ibrahim Adamu, one of the players from Zonzon community commended the initiative and prayed for its sustenance. Also, Miss Hajara Sani, a spectator at the event said she was impressed to see the men folk come together to collectively embrace the idea of ending violence against women.